Nairobi National Park, Kenya's oldest animal sanctuary, a glorious stretch or savannah set against the dramatic skyline of Nairobi, the cosmopolitan capital city of Kenya. There is a section of highland forest in which crotons, Kenya olive, Muhugu, ekebergia, markhamia and cape chestnut are characteristic trees. You can also find yellow barked acacia, acacia xanthophloea and the 'fever tree'. The only city in the world which neighbours a natural game protection area, harbouring over 100 species of mammals. The Park borders the traditional South Kapiti Plains and Kitengela Migration Corridor and attracts a range of exciting game. Although it is a seasonal park, most of the game, such as lion, leopard,cheetah, impala, coke's hartebeest(kongoni), eland, Thomson's and Grant gazelle, Maasai giraffe, hippo and buffalo, including the indigenous Black Rhino, live in the protection of the park all year round. Herds of plains zebra, wildebeest and eland enter the park during the great migration in July and August to enjoy the rich grazing until the next rains come. In recent years a unique trend has been recorded: with increasing frequency a cheetah has successfully raised seven cubs in the Park to the delight of local and international visitors. The Park is also an ideal starting point for ornithological safaris, with over 400 species of birdlife.Most birds in this park depend on year seasons. Game birds include helmeted guinea-fowl, yellow-necked spurfowl, shelley's(greywing)Francolin, Scaly francolin , harlequin quails, hartlaubs turaco, colies, ostrich, crowned crane, kori bustard, ground hornbill, European white stork, abdim's stork, Egyptian goose, black-necked heron, wood ibis and the yellow-billed stork.Sunbirds are much in evidence when the flowers on which they feed are in blossom. They include; brinzy, variable, malachite, amethyst, collared and the gem-like black-bellied beautiful sunbird. Weaver birds are also in evidence;black-backed reichenow's, and the mottled backed speke's weaver. The grasslands birds include; red-naped widow-bird and the Jackson's widow bird. Birds of prey include; secretary bird, martial, crowned, tawny and bateleur eagles. Vultures, buzzards(augur buzzard) and hawks are also present. Seasonally i.e in March and early April you can find Montagu's, European marsh and pallid harriers. Also in evidence are the migrating common and lesser kestrels. 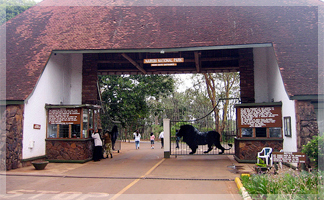 Nairobi National Park was Kenya's first ever National Park. Its golden anniversary occurs in 1996/97. It is the site of President Daniel Arap Moi's dramatic ivory bonfire, when in 1989 he torched 10 tons of ivory worth Kshs. 60 million, in a bid to eliminate the mass slaughter of Africa's elephants for their tusks. The site, near the main park gate bears a commemorative plaque with the legendary words "Great objectives often require great sacrifices". Since then, the great fire has been lit twice more to destroy confiscated stocks of poached rhino horn and ivory. There is no accommodation within the Park, but the city offers a wide selection of excellent accommodation to suit all visitor preferences. Many other tourist attractions are located close to the park, making it ideal for a day trip.